A complete implementation with access to all parameters is feasible, especially since Ctrlr supports LUA as a scripting language. At the end scripting the combined parameters is much less effort than writing the whole application by myself! Especially since we will inherit all these nice Ctrlr features such as Windows/Mac/Linux compatibility, support for VST, AU and Standalone mode, etc. The GUI design is very simple, because I'm not good at graphics. Very, very nice :) The jsynthlib version was a bit 'weird' to work with here, so i look forward to play with this Ctrlr-based editor!! Now, i really hope that someone would do the same for MBSID. I would give it a try, but i'm positive that i wouldn't get very far :) not smrt enough! At least with the MBSID it's more functional and compatible. I haven't had too many issues with it once you get used to the quirks. Of course, it doesn't work in tandem with a DAW which is annoying (in fact, I have to close out my DAW to use it as they both try to gain exclusive access to the MIDI port). Why doesn't Java doesn't work on MacOS anymore? 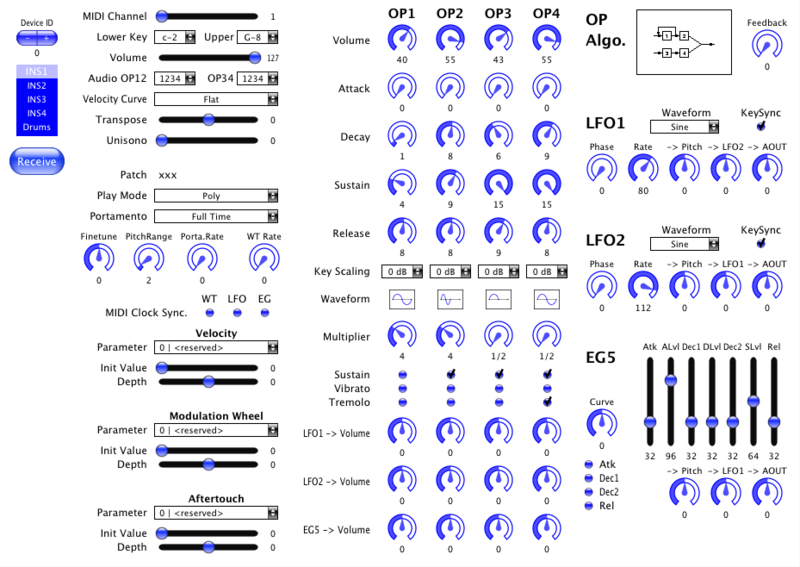 Next step is to learn how to create a separate view for drums and wavetables. Java itself works just fine on OS X. Minecraft is a Java application, after all. The problem is that some libraries were removed from Snow Leopard that implement MIDI support. You have to now install these separately from Mandolane. They do point out it is no longer required for Lion so perhaps these added MIDI support back in? I haven't tried Java on MIDI in Lion yet actually. All parameters except for Drums and Wavetables can be edited. Rotaries: circular mousemovment doesn't make fun, please change it to vertical. A simple up and down movement feels more native for use with a mouse. Waveselect and Algo.select: Change it also to vertical mouse responsiveness. It feels simply better. As i told in the other thread, i can't test the plugin with the MBFM hardware, because it isn't finished yet. I was just saying on another forum the other day someone should do a CTRLR-based editor for the MIDIbox/SammichFM. And here it is! This is fixed in Ctrlr version r965, but unfortunately this one has another issue with Lua scripting. As Roman wrote in the Ctrlr forum, he will fix this soon. It was on my agenda since many months... I was just unsure if I should program it in Juce directly, or take the Ctrlr project instead. I think that Ctrlr is the right route here, because it allows interested people to improve or customize a panel without programming knowledge. I will also create an editor for MBCV V2 - the firmware is running pretty stable, has great features (most recent one: a patch change mechanism which can be synchronized to the MIDI clock with selectable resolution!) but currently only a Lemur editor is available, which makes the project useless for most people. Please note that due to a bug the current "nightly build" release of Ctrlr doesn't execute Lua scripts anymore. Has anybody downloaded the WIndows binary r945 last week? Great, but I have some problem again. When I receive patch from MBFM then operator waveforms and patch name is not displayed on editor. I also cant't change patch name from editor. I'm using winXP, and Windows stable version Revision: 934. 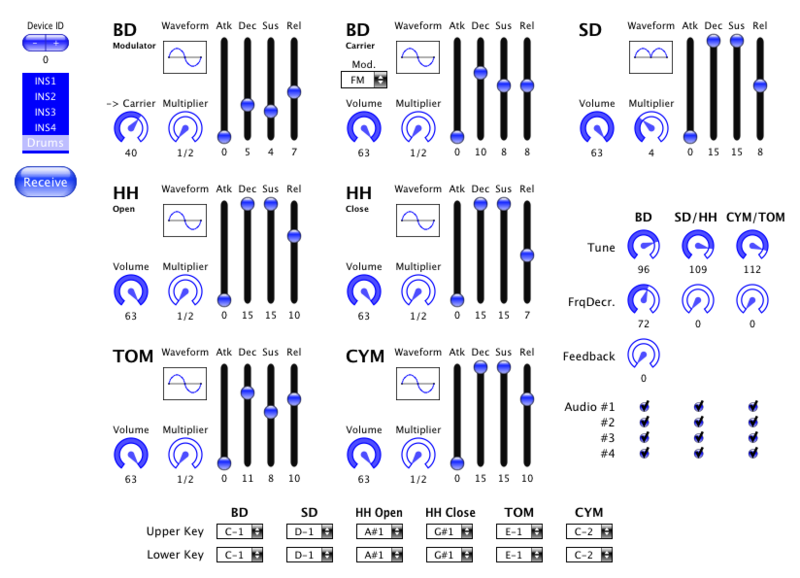 I uploaded v1.2 to the DDB: OP waveform and patch name are updated. But unfortunately I seem to have a problem editing the drums. I'm using Ctrlr 965 on Mac OS X (10.6.8) and I tried both as a VSTi inside of Cubase Artist 6 and standalone. I click the drum page button on the left of the Ctrlr Editor and the drum controls show up. But nothing makes any difference to the synth (the normal Inst1 page is working fine to edit a normal instrument though). I checked the MIDI which is being sent out and I noticed that the <type> byte is different between the InsX pages and the drums page. Is the 18 at the 8th position correct? Does anyone else have the drum page working? This is the actual issue - please use r946, you will find the link in the first posting! I tried to understand how ctrlr works. For that reason i tried to swap 2 of the Encoder. Tried with OP1 Attack and OP2 Attack. Adress is 20h and 21h. this works well while sending to the MBFM. But it doesn't works the other way, when i press the recieve button. Where do i have to change something for recieving purpose? Open the Lua source code viewer, select the "receiveMIDI" tab. It shows you a program that I wrote to map incoming SysEx data to the controllers. as you can see (when you read & (!) understand the code a little bit more), the controller name is relevant. So: your experiment will work if you change the controller names in these function calls as well. In my understanding i have to change the (0x20) to (0x21), the (0x21) to (0x22) and so on if i want to shift all CC after CC32.